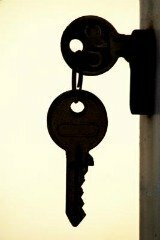 For keyed alike locks East Grand Rapids MI, call A1 Locksmith Service. 24 7 Emergency or By Appointment. Keyed alike locks have all the lock cylinders (the center part of the lock) and the tumblers set to all work with one key. These locks could be for your home, your business or even a set of Master Lock padlocks. Most people want the keys for their home or business keyed alike for convenience! One key instead of a bundle! If you want all the locks on the doors in your home or business to operate off the same key, you'll first need to verify that they are all one brand! Take the key to one of your locks and try it in all the door locks and deadbolts. If the key slips easily into all the locks (NOTE: it won't turn) you know they are all of the same manufacturer. Example: Kwikset keys won't slip into Schlage locks and visa versa. If they are not all the same brand, don't worry! When you call A1 Locksmith, we can easily replace the odd locks then rekey the original locks to all work off the same key. For a full explanation of what it means to have locks rekeyed . . .
At A1 Locksmith Service we carry a variety of locks. We will also custom order any style or color of lock in a variety of brands. Call for an appointment. We'll personally come out to your residence or business, check out your locks and make recommendations on how you can have the convenience of locks keyed alike! Master Lock has a wide variety of locks at different prices that can be purchased keyed alike. You can also order additional locks with the same key # as locks you already have so they will all work off the same key.